Confession is good for the soul but best saved for your priest. This was one of my dad's favorite expressions, and by that he meant that while it is good to unburden yourself of those things that torment us, it is best to keep these revelations limited to as small a group as possible. The curious thing about this wise old saying is that neither of us would actually confess anything to a priest because neither of us are Catholics. 2011's Priest (not to be confused with a 1994 film with the same name) is a piece of junk, has a sense that it's a piece of junk but has too much pride in itself to admit to, to confess that, shall we say. In an animated prologue, we are given the story: humans and vampires have been at war for many a long time. The Church (given the emphasis on such things as confessions, rosaries, and the citizens performing the Sign of the Cross I'm figuring it's either the Catholic Church or something similar) eventually created a select group of Priests (the Navy SEALS of The Faith) which managed to vanquish the vampires, but with that the Priests were disbanded, to live their lives in as close to anonymity as possible given the cross etched on their faces. Within the confines of the cities, the Church is all-powerful, with a Council of Monsignors ruling a benevolent dictatorship. 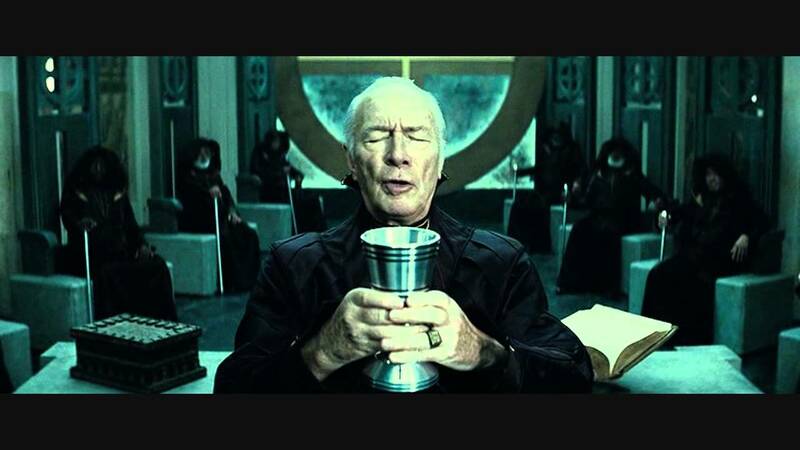 The Head Monsignor, Monsignor Orelas (Christopher Plummer) is not a brutal dictator, but repetitively admonishes the population that "To go against The Church is to go against God"; where's Martin Luther when you need him? Our Priest (Paul Bettany) is haunted by one of his missions where one of his fellow Priests was taken by the vampires and he was unable to save him. Now, he receives news from Lawman Sheriff Hicks (Cam Gigandet) that Priest's niece Lucy (Lilly Collins) has been abducted by vampires or creatures similar to them (I think the term for them is Familiars: I confess, no pun intended, to being a bit lost as to what exactly the Familiars are). Having been warned by Monsignor Orelas and the more sympathetic Monsignor Chamberlain (Alan Dale, creating an unintended reunion of some of The O.C. cast) that to go and attempt a rescue is forbidden because it goes against Church doctrine, Priest goes out anyway into the Wastelands. Lucy has been taken by Black Hat (Karl Urban), whose true identity is a mystery until the end. Black Hat has an army of vampires that is going to overtake humanity, and the abduction of Lucy is all part of a plan against Priest. The Monsignors, furious that Priest has gone against their commands, send out four Priests to capture the renegade. Included in this group is Priestess (Maggie Q), who appears to be the leader of the hit squad. Priestess catches up to Priest and Hicks, and they realize the plot of the vampire army and Black Hat after the three other Priests are killed in the human city of Jericho. Now, Black Hat has to be stopped before he unleashes his vampire army on the other city, and we learn the truth of the relationship between Priest and Lucy (as well as that of Priest and Priestess). I found myself admiring in an odd way just how seriously everyone was taking Priest. The somber tone Scott Charles Stewart takes with the material both in how he directed the actors and how he visualized the film, suggests that he was trying to channel certain other films. The City has the obligatory nods to Blade Runner (which begs the question why does the future always look the same) and the plot (written by Cory Goodman from the Korean graphic novel series) appears to be straight out of The Searchers (two men with familial and/or romantic connections to a young kidnapped girl go to bring her back). To my mind, there has to be more than a passing resemblance between Priest and The Searchers in this regard: in both films, the older of the two makes it clear to the younger that if the victim is "changed" she will be killed. Let me make it clear: I'm not saying that Priest is in the same league as The Searchers, only that they have similar plot points (and those plot points are the only things they have in common). I could make the case that Priest also borrows from the Sergio Leone "Man With No Name" films, since Bettany delivered his lines in a gruff, Eastwoodesque growl. With his role in Priest, along with that of the fallen angel Michael in Legion and as Charles Darwin in Creation, I'm beginning to wonder if Bettany has gone from being merely atheistic to being downright determined to be considered an enemy of Christendom. I am being facetious, but how else can you categorize a film that takes Christian trappings and uses them so nakedly to come almost close to making a mockery of them. Take for example when Priest and Hicks come to a vampire reservation. Before a climatic battle, Priest begins to quote from Psalm 23 before unleashing a group of cross-shaped shuriken or ninja blades. Granted, it's always nice to see the cross be seen as a source of strength though not so much when it's used as an instrument of violence, but one wonders how it was that in this alternate world Catholicism (since from the rosaries that double as blades to the College of Cardinals-like Monsignors Chamber) gained such power while leaving no room for such things as an exploration of the soul. It is a bit like seeing what a dystopian world would be without the Reformation. Yet I digress. I can say that I think Bettany is too an actor to be scowling around in Priest, and his Priest is a remarkably empty being. Though the mission is to rescue his 'niece', we never see him close to showing any emotion that would signal he cares, let alone loves. There is some understanding that Priest and Priestess may harbor romantic feelings for each other, but Priest doesn't concern itself with exploring the character's hearts. As played by Bettany and Maggie Q, Priest and Priestess may be in love because the script says so, not because either of them projects true longing. I'll give that flaw to the fact that the script kind of shoehorns this suggestion: we never see Priest being anything but all business, and knowing nothing of their background we figure they should have feelings because one is a man and one is a woman, but nothing in the story or performances tells us anything about each other. I figure that Plummer was having fun in being in something as self-consciously trashy as Priest (and it brought to mind Judi Dench in The Chronicles of Riddick, another film that had a great actor in a role against type). To be fair, the Monsignors reminded me of the Time Lords from Doctor Who with their robes and great sense of self-importance, but Plummer to his credit appears to relish his time as this unofficial dictator. Gigandet is also to his credit taking Priest exceedingly seriously, but again while we're told that Hicks and Lucy are in love we never see any sense from Gigandet and Collins that they even knew each other all that well. I will also compliment him on the fact that he didn't pout in Priest, which is his usual acting technique whether on The O.C. or Burlesque. It's a better performance than most of his career, but one wanted to tell him to lighten up and show a sense of humanity instead of trying to outdo Bettany in 'this is a serious film' mode. Collins was in the film for far too short to give a true reading of her abilities. Going to Urban, again like Bettany, he is a far better actor to be in Priest, and I'll say he was directed to be a bit over-the-top. Again and again, none of the characters in Priest appeared to be human, just rather robotic in how they approach the story: one must kill, one must not smile, one must look super-serious before going medieval after reciting the 23rd Psalm. One plot point that confused me was about the relationship between Lucy and Priest, perhaps because our main character never got a name is one reason why he never appeared human. Bettany is just short of 40, and Collins is 22. Granted, the age difference is plausible to make the 'truth' believable, but still a bit of a stretch to believe, as is the suggestion of romance between Collins and the nearly 30-year-old Gigandet (OK, 28). In an odd way, Bettany and Collins look too young to make the story believable and even more oddly, Gigandet looks too old. Finally, what gets me is the shameless plug for a sequel, one of the things that drives me bonkers while watching a film. If Catholics get in an uproar over certain elements in Priest, with a little left over for Protestants and even Orthodox Christians, they need not worry, for in a few weeks, Priest will have been exorcised from the collective minds of film goers. It isn't hideous, but aside from the opening, quite uninteresting. I think it would have worked better if the whole film had been animated. If it had, it would have had a prayer of being good.